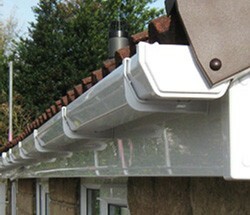 Many homeowners don't realise that in order to keep your home safe and protected from the elements, you also need to take good care of your roofline which includes your fascias, soffits and barge boards. Many older homes in Hull still have soffits, barge boards and fascias made from timber which can rot, split and become damaged. This can lead to damp problems and water leaks in your home. uPVC doesn't warp or split and it is resilient in all kinds of weather. It can withstand a wide variety of natural temperatures as well as severe rain and snow, making it perfect for barge boards, fascias and soffits. It is also incredibly cheap to manufacture making it cheap to buy, and it's easy and quick to install. This means it's not going to cost the earth to replace fit. We are able to offer free advice, a free consultation and free estimates for any of our roofline solutions so why not call us today on 01482 549 915 and we'll assist with whatever you need. We are well established and have a great reputation, so find out for yourself why we have been making our customers happy for so many years! All our services are covered by lengthy guarantees so you are safe in the knowledge that you're covered when you use us.